Brunch N' Cupcakes: Itching for the Weekend! This past weekend was just what I needed... A lot of relaxing! I enjoyed the beautiful weather during Happy Hour, enjoyed a great run, got my haircut, soaked up the sun on a fabulous boat, and enjoyed the company of some great people! Couldn't have been better! I enjoyed going with the flow and just enjoying ever moment of the weekend! I even had time to start a new book! The countdown to the long holiday weekend has begun! I am itching with anticipation for Friday to get here! I leave Friday night to fly down to good old New Orleans for my lovely sorority sisters wedding! It is going to be one heck of a weekend! I cannot wait to see some of my closest friends, and tear up the town with them! This weekend will be just like the good old days! With that being said this week is going to have a short list of new pinterst recipes, mainly because I am trying to clean out my fridge! Lets just say it is very hard to cook when your fresh produce supply is dwindling! But here is what I got for you this week! I feel like this first recipe has been on the list for weeks now! 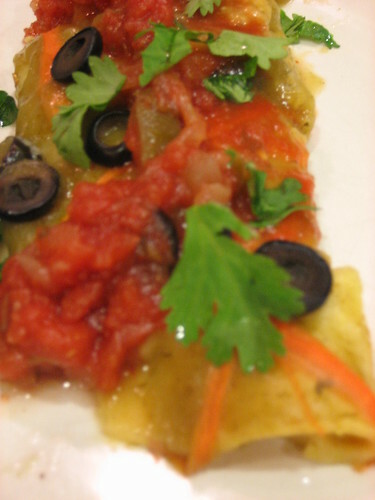 Pea's and Thank You's Lentil Enchiladas. Don't worry I am actually making them this week, in fact the filling for these babies is being prepared right now! I love that this recipe uses greek yogurt! This recipe is very similar to the one I make, only this one calls for apple cider vinegar! I think its going to be delicious! How are you sending memorial day weekend? I have to try that chicken salad! It is one of my weakness foods, give me the choice of a chicken salad sandwich and almost anything else in the summer, I'll chose the first. I like that this recipe is a little more healthy, thanks for sharing! Cranberry chicken salad sounds incredible!